I quite like the central European feel of the title of this post. Most of these countries we are traveling in extract their motorway tolls by requiring users to purchase a vignette, or sticker, for the car windscreen. These can be bought at petrol stations for periods as short as 10 days at a cost of around $20. Because we’re only going to be in Slovakia for a couple of days and would use only about 50km of motorway, we chose to travel on lesser roads. This proved to be a pleasant, if slower option, travelling through smaller towns and attractive countryside. We left the motorway near the Czech border and pulled into a shopping centre for a coffee and didn’t know what country we were in until the menu price of a cappuccino at 45 proved they were using Koruna rather than the Euro used in Slovakia. Tonight we have a nice room in a hostel within 20 minutes walk of Bratislava’s old town and unless it proves too noisy later it seems like a good choice although parking was a bit of a worry as it always is near town centres. 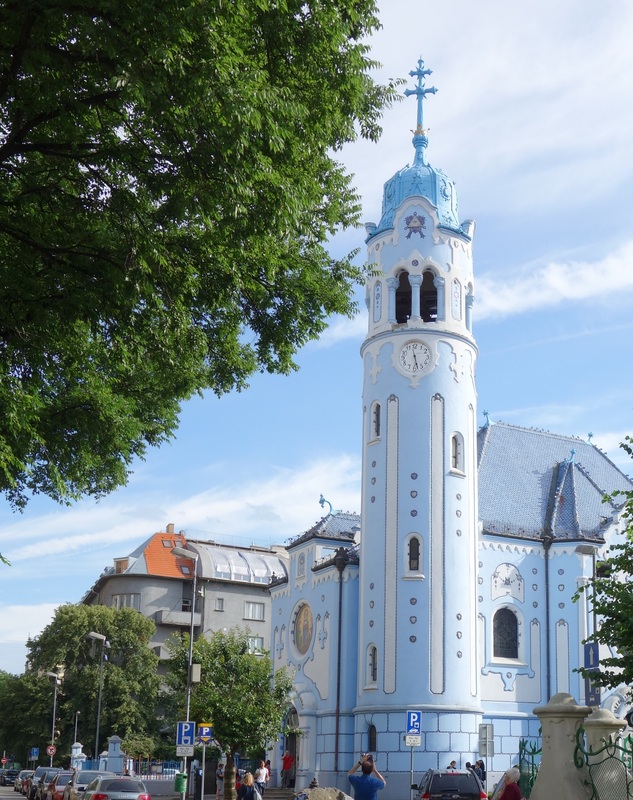 We are just back after seven hours in the city visiting the old town centre, the castle (on a hill above the town with great views), St Martins cathedral (chalk another one up), the blue church and spending a while sitting on the banks of the Danube. It’s a nice town and because it is not a premier tourist destination it is not overwhelmed by people.